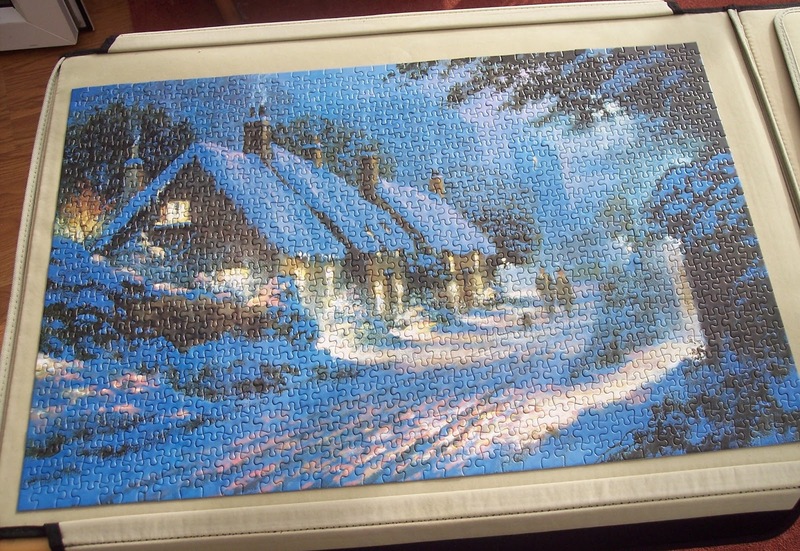 This snow scene I did over the New Year and into January, it took me ages as there was so much blue that all looked the same. Very pleased with how it looked when it was finished though. A freebie my daughter picked up at the library. Another snowy scene (sensing a theme here?) 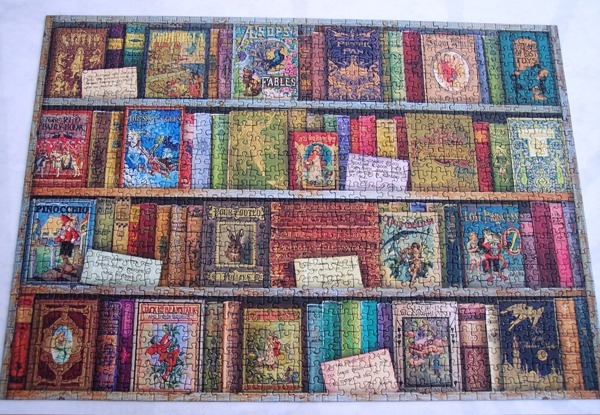 It was odd because it turned out that Margaret at Booksplease was doing this at more or less the same time as I was. 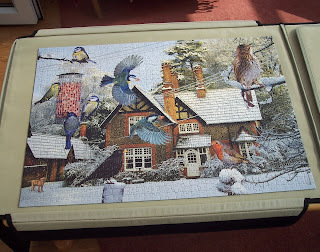 A fun one to do anyway, showing one of my favourite subjects: birds. 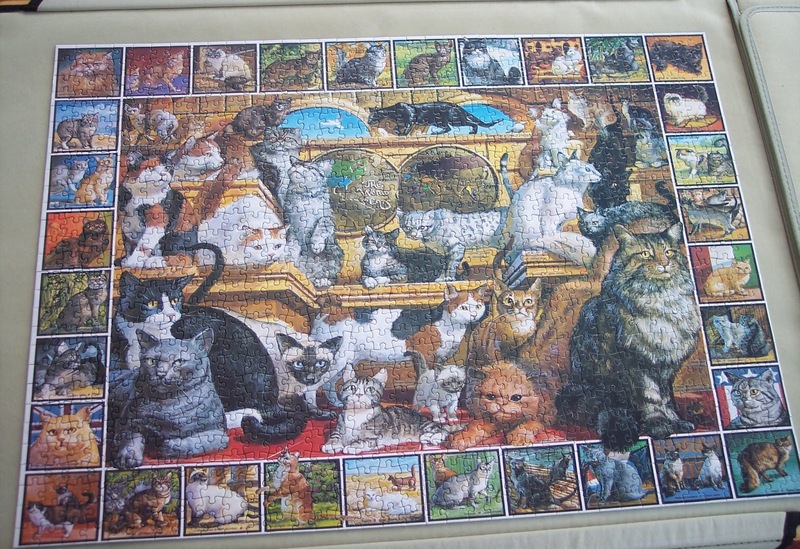 Cats, cats, cats! I had no idea there were so many breeds! Another enjoyable one. 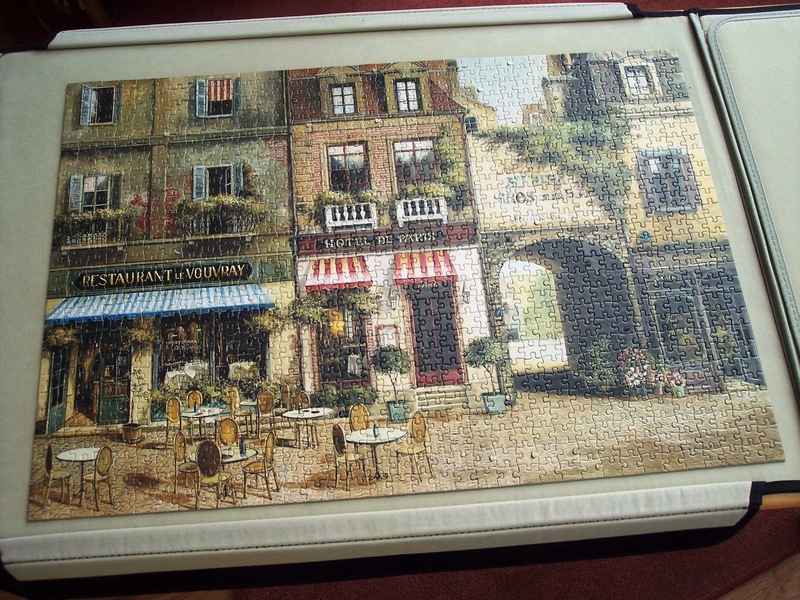 I bought this for £2.50 in a charity shop... it had never been opened. 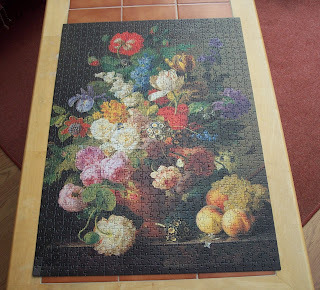 Lovely one to do, I do love puzzles of these gorgeous botanical paintings. 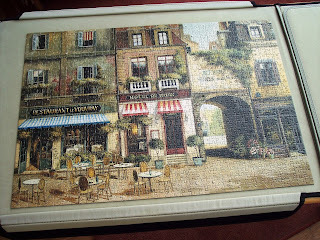 Another library freebie of a Paris scene and also fun to do. 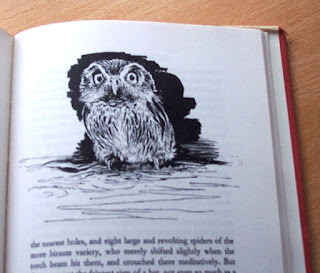 I had a couple of reasons for suddenly deciding to read The Whispering Land by Gerald Durrell. Chief among them is that I'm reading Douglas Botting's biography of him (pic to the left under 'currently reading') and have reached the stage in the book where he goes off and does this trip to Argentina. Because I own the book I wanted to have read it before Botting discusses and tells me all about it. Another reason is that I've been watching and enjoying ITV's drama, The Durrells, so was in the mood for a Durrell travel book. 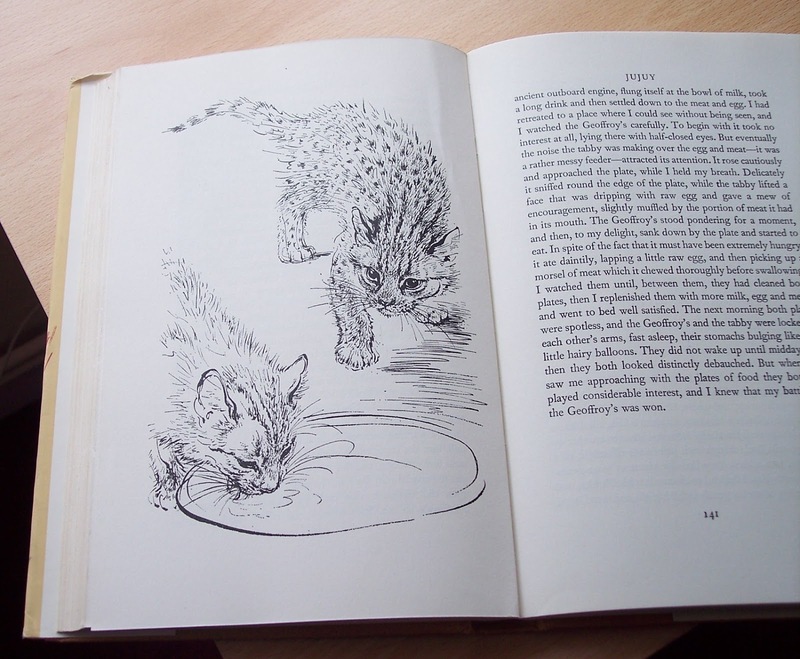 This trip to Argentina was Gerald Durrell's fourth animal collecting trip after two consectutive trips to the African country of The Cameroons and one to British Guyana in the north of South America. By this time his idea of starting his own zoo is beginning to take hold although he's still collecting animals for other zoos as well as his own. Many South American animals were, at this time in the early 1960s, rather an unknown quantity though Darwin had noted quite a few on his trip to Argentina in the 1830s. Durrell includes a quote from The Voyage of HMS Beagle at the start of every chapter so it's clear he's very much inspired by Darwin's travels. It was in this desert area, protected from the sea wind by the encircling arm of the dunes, that the penguins had created their city. As far as the eye could see on every side the ground was pock-marked with nesting burrows, some a mere half-hearted scrape in the sand, some several feet deep. These craters made the place look like a small section of the moon's surface seen through a pwerful telescope. In among these craters waddled the biggest collection of penguins I had ever seen, like a sea of pygmy headwaiters solemnly shuffling to and fro as if suffering from fallen arches due to lifetime of carrying over-loaded trays. Their numbers were prodigious, stretching to the furthermost horizon where they twinkled black and white in the heat haze. It was a breath-taking sight. 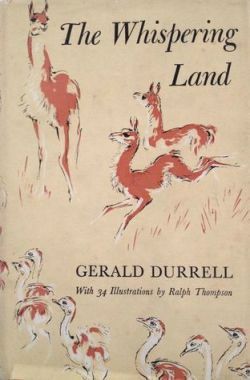 In all, Durrell visits three different parts of Argentina... the coastal regions of Patagonia, the pampas, and the tropical, forested area known as Jujuy in the north. Hard to relate all of his adventures, best to read the book yourself to experience his beautifully descriptive writing and wonderful humour. 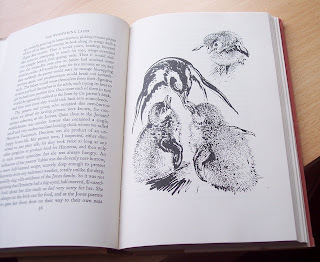 I particularly liked an amazing piece about the journey one set of penguins has from the colony to the sea. Another section where he sits up all night - or tries to - to catch vampire bats feeding on the horses is also hilarious. And he wakes up early one morning, after a night's asleep under a Landrover, to find a family of foxes playing with a roll of toilet paper. His description of this episode is pure joy. The book is illustrated all the way through by Ralph Thompson and these drawings make the book come alive. I'm no expert on wildlife so it's nice to actually see the animals Durrell was collecting. 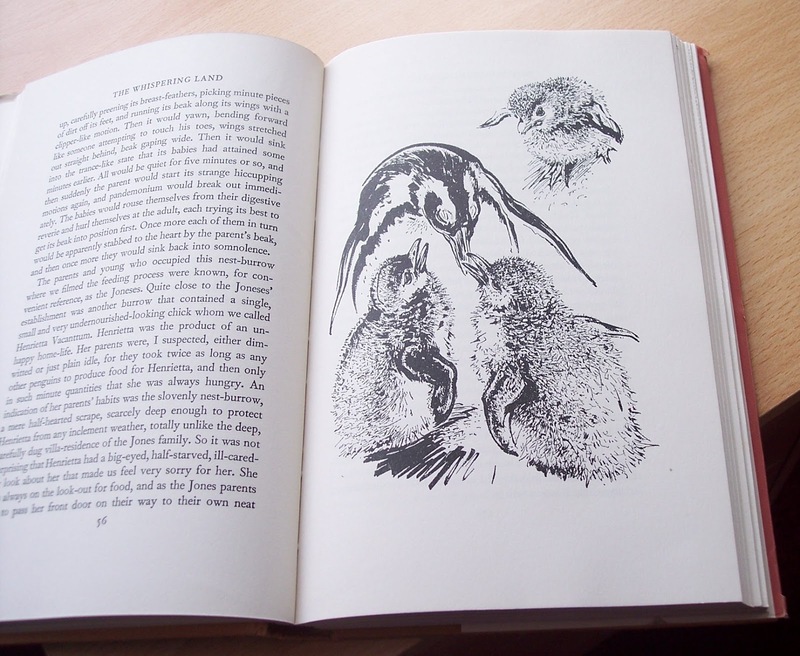 The Whispering Land was a joyous little read. It's one of the lesser known of his travel books I think... he seems to be much more famous for his African safaris to collect animals than this trip to Argentina. But the trademark humour and beautifully descriptive writing is still there and this is well worth reading. I can also highly recommend ITV's drama series, The Durrells, which I thoroughly enjoyed... beautifully acted, and such stunning scenery, and it's back for another series next year I gather. 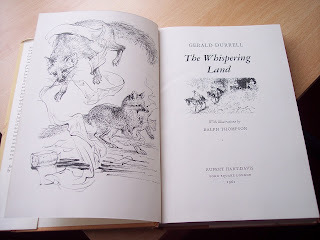 The Whispering Land is my book 14 for Bev's Mount TBR 2016 Challenge. A bit behind with reviews so this is one of my two in one posts... two books I devoured very quickly because they were so readable. That's always nice. 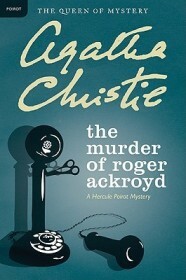 First up, The Murder of Roger Ackroyd by Agatha Christie. Roger Ackroyd is a middle-aged man, a manufacturer of wagon wheels, and very wealthy. He lives in the village of King's Abbot, with various relatives, all of whom rely on him financially. It was said that he might marry Mrs. Ferrars, a widow, but she dies one night attended by Dr. Sheppard. Dr. Sheppard's sister, Caroline, a notorious collector of gossip, insists that Mrs. Ferrars committed suicide, the reason being that Caroline is sure she poisoned her husband and was so full of remorse she killed herself. Then Ackroyd himself is murdered, stabbed in the back one evening after receiving a letter from Mrs. Ferrars, posted before her death. 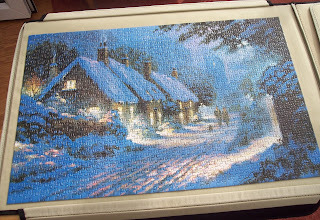 The house and village are full of suspects. It seems a lot of people needed money from him and there is even a whiff of blackmail. One of the suspects, Flora, Ackroyd's step-daughter, goes to Dr. Sheppard's new nextdoor neighbour for help. He is a recently retired private detective who has taken up growing marrows. His name... is Hercule Poirot. Funny how you can sometimes get so wrapped up in a book you devour it in a day. Mind you, it's not a huge book and I read it in large-print format so it was an easy read. But nevertheless it's the kind of book you find you can't put down. It's narrated by Dr. Sheppard, so you get quite an interesting viewpoint, one that belongs to the village where the crime is committed and who knows the suspects intimately. You get a real sense of the eccentricities of Poirot too, of his secretiveness when he knows things others do not - how irritating this can be, especially for Sheppard who is trying to emmulate Captain Hastings for Poirot. It's full of humour, one chapter entitled, 'An evening at Mah Jong', is absolutely hilarious... Agatha Christie had a very good eye for the humour in everyday situations and I don't think she's given enough credit for that. This is definitely one of the best Christies I've read so far and I'm told it's generally thought to be one her best as well. The Murder of Roger Ackroyd qualifies for Bev's Vintage Mystery Cover Scavenger Hunt challenge under the category 'Telephone'. 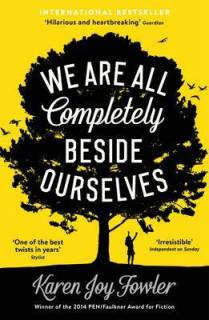 Next, We Are All Completely Beside Ourselves by Karen Joy Fowler. Rosemary Cooke lives with her mother and father, both scientists, in Indiana. Once upon a time she had a sister and a brother but both of them have disappeared. Rosemary has just started college in California. She rarely tells people anything about herself so is rather a solitary student. Her life is one of forgetting, of not wanting to remember certain things about her childhood. So far she has succeeded in burying everything but for how much longer can she keep her secrets? And does she really want to? She needs to find answers to certain crucial questions and keeping secrets will not help in that quest one iota. Well that's a very sparse description! Necessarily so because this is a book you need to know very little about before you start reading. 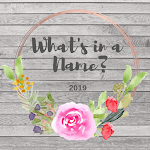 About a third of the way through comes a huge reveal and although some may guess the big secret, I did not: I was taken totally by surprise. This is one of the most thought provoking books I've ever read but sadly I can't say why. I can say why I liked it. I liked the first person narrator, Rosemary, very much; she's brave and candid and a very forgiving person. I liked the sadness of this book... which might seem like an odd thing to say, but I did. I learnt a lot and that's where the sadness comes in, there's unintentional cruelty, people doing things they maybe shouldn't just for the sake of curiosity, for science. To be honest, it's heartbreaking. The book divides opinion... some seem to dislike it intensely, others really love it. I loved it and would like to read more on the subject it covers. A bit of a sparse list! But, having said that, it must be said that three of those books were over 400 pages and not easy reads... or they didn't seem so to me. 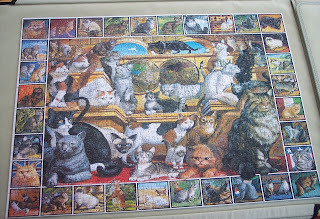 Perhaps I made unduly heavy work of them, I don't know. Some months I can whip through a 4 to 500 page book in several days, other months I plod through and the book seems endless. I think that's just the way it goes sometimes. 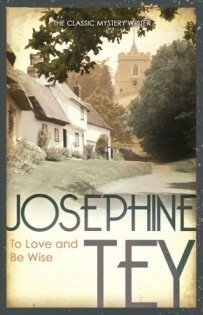 To Love and Be Wise by Josephine Tey was absolutely delightful. I've read three books by her this year and not one has disappointed... all three got five stars from me on Goodreads and deservedly so. The mystery was a 'real' mystery - the ending completely surprised me - and the writing was exquisite. Onwards and upwards. May is going to be a bit of a difficult month probably, late May anyway, but I still hope to be around a bit. Happy reading. My second book for Carl's Once Upon a Time X challenge is The Raven Boys by Maggie Stiefvater. Teenager, Blue, lives in the town of Henrietta, Virginia and is the only non-psychic in a house full of female psychics, including her mother, Maura, and various eccentric aunts. But Blue does have a gift, she can somehow act as a conduit to increase the power of others: she makes things louder. But there is a problem. Her female relatives have looked into her future and ever since she can remember Blue's family have told her that if she kisses her true love, he will die. An aunt of Blue's has come to stay, the mysterious Neeve. It's St. Mark's Eve and Neeve has taken Blue to a ruined church to see the procession of the spirits of the dead. These are people who will die in the coming year. Blue generally goes with her mother and always sees nothing, but this year is different. She sees a boy who whispers that his name is Gansey. He is wearing the uniform of the local private school for boys, Aglionby: he is a Raven Boy. When Blue asks Neeve how she was able to see this boy, Neeve tells her it means the boy is either her true love, or she is the one who kills him. For me this book was a bit of a slow burner. I liked Blue and her household immediately, the aunts were beguilingly potty and Blue herself is an interesting character. Her 'voice' in the book is very strong. The problem for me was that I found the four boys quite irritating for the first hundred pages. I think possibly the reader is meant to feel that way, teenage boys are, after all, teenage boys. I just thought there was just a bit too much humdrum stuff about them... I wanted the author to get to the point of the story more quickly. When that did eventually happen the book became very good, very quickly, and the boys a lot less annoying. I liked the idea that the town of Henrietta was, supernaturally, a sort of hub. The atmosphere of the book is rather pagan and mystical, and the Welsh connection is interesting. The theory that Owen Glendower's body was shipped across the Atlantic to be buried in Virginia - I forget why - is intriguing and makes for an excellent theme to base a paranormal fantasy around. 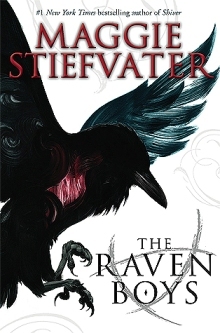 I was reminded a bit of Alan Garner and Susan Cooper's books, even though the author, Maggie Stiefvater, is American. The writing is not quite up to the standard of those authors but it's certainly engaging and very readable. I believe there are a total of four books in this series and I definitely want to read them. Once it gets going this is a good book, older teenagers would love it I suspect, but I think anyone who enjoys a bit of paranormal fantasy would enjoy it.